Boy Making Snowman | MWAH! S&P Shakers Figurines | One Price Low Flat Shipping! Mwah! 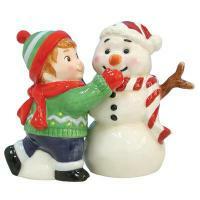 Salt & Pepper Shaker Set from Westland Giftware, Boy Making Snowman. Made of ceramic with glossy finish. Measures 4" tall. Hand wash only. This seasonal shaker set features a young boy dressed in a green knit sweater with matching cap making a happy snowman that has been dressed in a candy cane red and white striped scarf and cap. A magnet holds the two pieces together. Delightful holiday decor!